It’s October, which means everything in stores is pumpkin flavored and orange. But another bounty of the season’s harvest is corn, and there’s no corn more delicious than elotes. Elotes are grilled corn on the cob coated with a creamy, cheesy chili sauce. They’re commonly sold by street vendors in Mexico, pierced through with a skewer for easy eating. 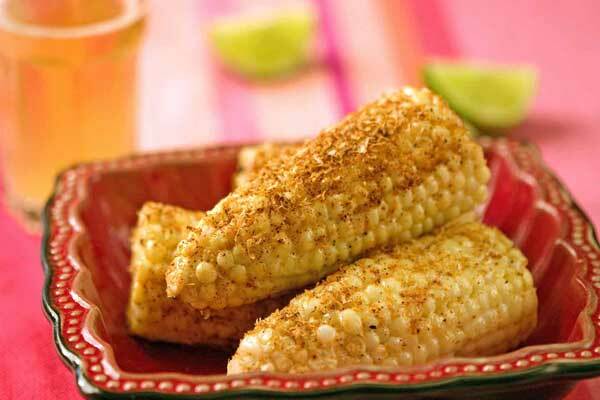 Because the only cooking required is grilling the corn, you can easily make elotes at home. This recipe is great to make with kids, for dinner dates, or just as a snack. The sauce stores well too, so you can make it in advance for whenever you’re craving elotes. A little forewarning though – despite being easy to make, this recipe is messy to eat. Make sure you have napkins handy, as the sauce tends to get all over your cheeks. The ingredients are easy to find, and those that are more elusive can be easily substituted. Cotija cheese is sold in most grocery stores’ cheese sections. Crumbled cotija is easier to use, as it blends into the sauce more (and you don’t need to grate it yourself), but it may be harder to find than blocks of cotija. If you can’t find cotija, you can use crumbled feta instead. Likewise, sour cream replaces crema in a pinch. First, shuck your corn and cut the ends off – this will make it easier to stick in corn holders. If you don’t have corn holders, or want to go the more traditional route, you can also spear the corn on a skewer. Elotes are best when the corn is lightly browned, which adds a crispness and smokiness to it. This can be accomplished either on the grill or in the oven. On the grill – heat the grill to 400F, and cook the corn for about 3 minutes on each side, or until that side is lightly browned. Then, turn it over and cook it for another 3 minutes – this way both sides get equally browned. In the oven – preheat the oven to 400F. Lightly butter the corn and wrap it in tinfoil. Put the tinfoil-wrapped corn on a cookie sheet and cook it for about 35-45 minutes or until it’s lightly browned, turning it periodically. While the corn cooks, we start on the sauce, which is what makes elotes so tasty. Mix your crema and mayonnaise evenly in a small bowl (for easy cleanup, make it in tupperware – you can store the extra for snacks later). Add in the cotija, chili powder, and garlic. If you’d like an extra bit of kick, try adding some cayenne. You can also add in guajillo or chipotle powder for a slightly different flavor, or a bit of finely chopped cilantro. When your corn is done cooking, take it out of the oven and let it cool slightly. Once cool enough to handle, stick your corn holders in or spear the corn on your skewer. Spread the sauce evenly across the corn and squirt with a bit of lime juice. Make sure you have some napkins handy, and then go to town. Elotes pair nicely with Mexican food, Netflix, and light summer beers. Craving something different? Find more recipes here. Note: I apologize that I don’t have a picture of my own elotes to accompany this article – I forgot to take a picture last time I made them. Mine are much creamier and cheesy than the ones depicted here.